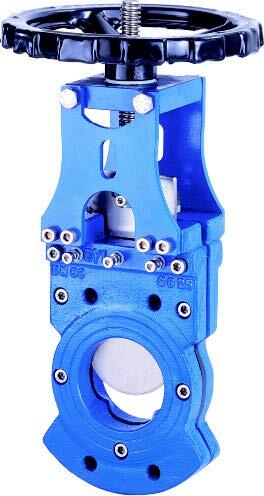 What are knife gate valves? Knife gate valves are designed for in line or end of pipeline applications for low pressure and have a number of advantages over other valve types. Unlike conventional wedge gate valves, there is no wedging action to cause the blade to jam and the overall length is less which helps in confined spaces. Unlike ball valves, there are no cavities or dead areas in which material can settle. The shorter overall length is an advantage which helps in confined spaces. Unlike butterfly valves there are no restrictions in the bore when the valve is fully open and the blade does not have to push material aside when opening and closing.